I went into full panic mode as I couldn’t believe she was also going to have similar issues that her brother had had and maybe even more severe, as I had remembered him engaging with me a lot more at this age than she was doing. Ruth was amazing and helped me from when Daisy was only a few months old and taught me how to try and engage her, even from such a young age. It was actually really simple things I could do with her on a daily basis and slowly I started seeing massive improvements. It really helped and also gave me a feeling of empowerment that I was actually doing something that would potentially change the outcome for her. 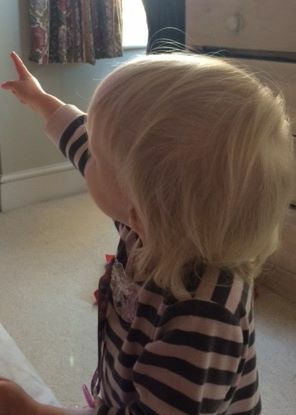 Fast forward to now, Daisy is 17 months old and she has a vocabulary of 50+ words, she is pointing, sharing, engaging, enjoying toddler groups, has joint attention and lots of gestures. She loves dancing and singing and doesn’t stand out from her peers at all at this point. I’m still keeping an eye on her development but I know she has benefited massively from all the early help she has had and it could have been very different if I hadn’t gotten her this help at such an early age.